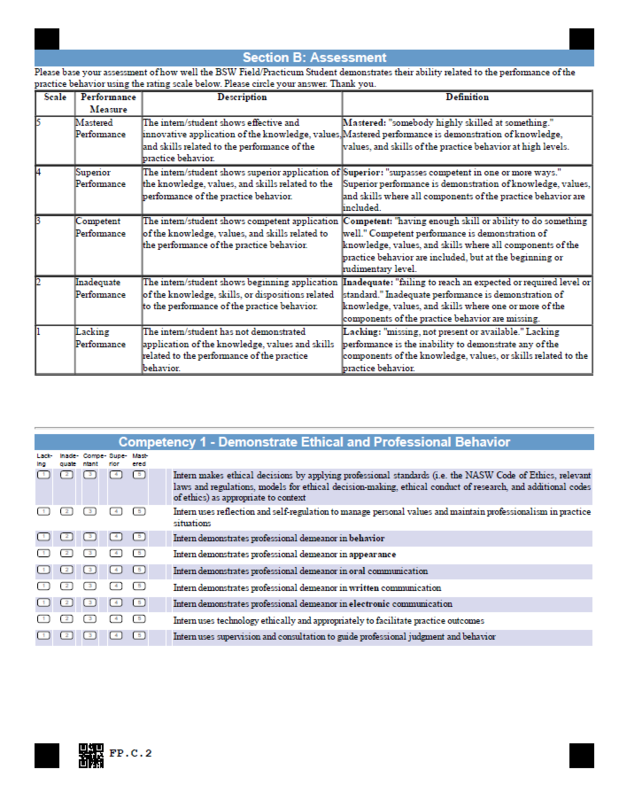 The SWEAP Field Placement/Practicum Assessment Instrument (FPPAI) was developed to assess student practice of the EPAS Core Competencies in Field Placement/Practicum. The FPPAI consists of a series of items, related to each EPAS Core Competency, and related behaviors, to be scored on a 5-point Likert-type scale by the field instructor. 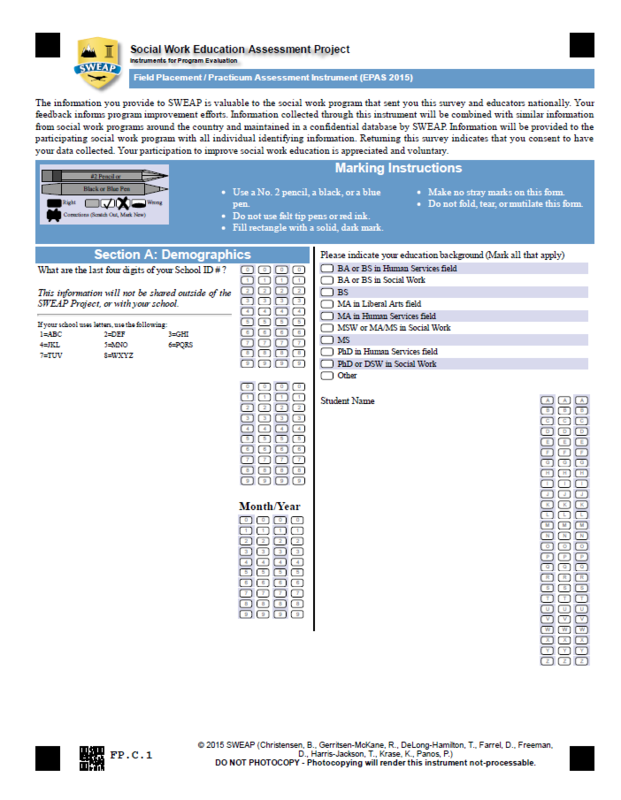 In addition to the quantitative portion of the FPPAI, an optional qualitative questionnaire/text field option is available in online version only. Please note, aggregate reports for 2015 FPPAI instruments ordered after August 1, 2016 will provide measures of at least one dimension for each competency. For an overview of the FPPAI, check out this video. Based on expert feedback, and meetings with key stakeholders, the SWEAP team has decided to remove the N/O (Not Observed) category from SWEAP Field Placement/Practicum Assessment Instruments (FPPAIs). All students, whether starting their social work field placement experience at the bachelors or master level, or in their advanced year of graduate study, should be provided the opportunity to practice each social work competency and related behavior. Social work programs should work with students and field instructors, throughout a placement, to ensure that students have the opportunity to perform all relevant competencies and related behaviors. Evaluation of a field placement experience is an assessment of overall professional competence. Therefore, student performance needs to be measured on all competencies and related behaviors in order to meet EPAS standards.